Alchemy: A power or process of transforming something common into something special. I love creating little figures. No matter what medium I'm using, at some point I always seem to find myself working up little figures, whether they are angels, faeries, little people or like this one, a wildly whimsical and colorful goddess figure. She's a little fiber goddess. I'm reminded of the kiln gods from pottery class, a little figure to watch over the creative process and help ensure a happy outcome. It should be a happy outcome too, because this little goddess was a part of a happy accident. Quite some time ago I was experimenting with nuno felting and while I knew that a more open silk fabric was used as a foundation, I thought I'd give it a try using one of the silk scarves I use (and had on hand) for silk painting. Well the fiber did not entirely mesh with the silk. I was not, however, the least bit disappointed, because what I ended up with were all these gorgeous, wildly colorful, ropes with beautiful clusters of organic growths and tuberous roots! I wanted more! So I tried to duplicate the process and it turned out entirely different, though equally gorgeous, I say gorgeous without meaning to take any of the credit, since the alchemy at work here was clearly out of my jurisdiction. This second time, I was given something more like fabric. Stunning passages of color and texture resembling a topographical map, I was in love! I knew I would use these beautiful felted pieces, but it took awhile to discover what was needed. They were quite beautiful all on their own, several times I pulled them from their box and spread them out on my work table, arranging and rearranging them, but they always ended up put back away. It just wasn't time yet I guess...till now. I suddenly (haha after a year!) knew that I needed to spin them into a yarn. I carded up a nice sparkly batt, chock full of texture and color. 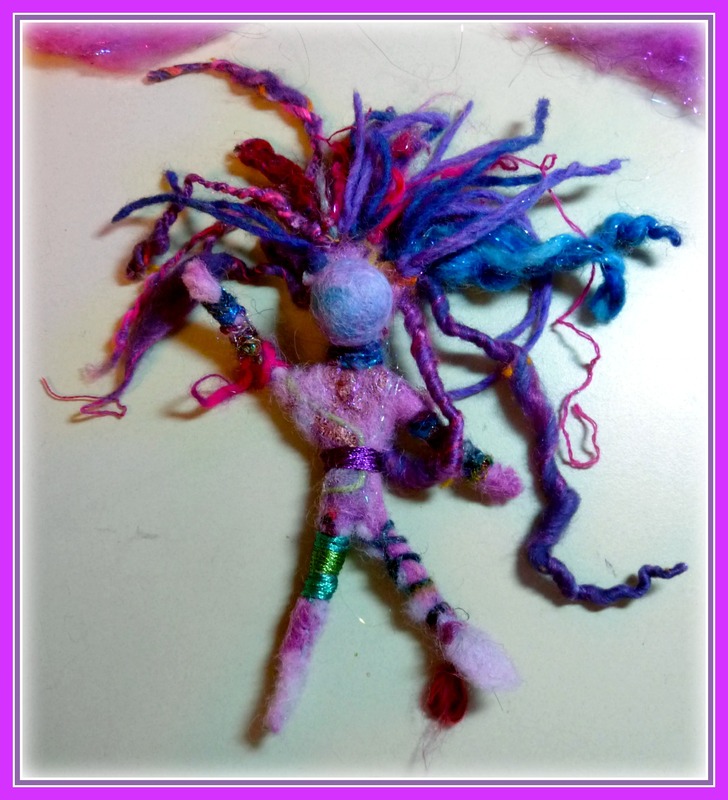 But before I could spin, this little fiber goddess just needed to be made. Her headdress is a crown flowing with hoarded scraps from my handspun yarn. It's hard to see in this picture, but her breastplate is an Indonesian silk cocoon that I had dyed pink. She'll be added to the yarn once it's plied. 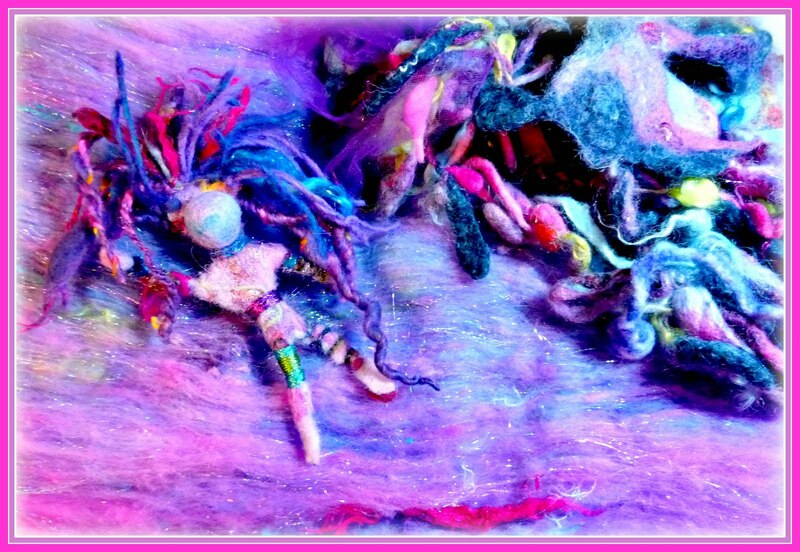 It was crazy fun spinning in the felted pieces. Thank goodness I have a Lendrum, I was able to power the bulky sections through all the tight spots as it made it's way on to the bobbin. And once on the bobbin, I tucked all the flailing tubers and organic growths safely under the yarn as I went along. Next week I'll show how it all came out! Before I end for this week, I want to thank Heather Woollove for the fabulous messenger bag she felted for me, you can see the whole amazing process over at her blog, be sure to check it out! Part 1 and Part 2. Heather and I decided to do an exchange, I am busily working away on hers, she and her work are extraordinary, I hope I can do her justice with the gift I am making for her! Love it! I always adore your colors and textures and it truly is fun to experiment. Missed you last week. Hope to see you at our December get-together. This little Goddess is delightful and will watch over you as you spin. How wonderful. Anxious to see the finished product. Ah, the very essence of the joy of creating...all surprises and beauty! Wow, that is some funky chunky yarn. It looks like your little figures were spun up. Wow. Your Fiber Goddess is Amazing! that's one sassy looking godness. love it! I love that headdress! The gold band on her left leg is also cool. But that bag was for you? Awesome! I love, love, love my Heather Woollove messenger bag. It gets compliments everywhere I go. 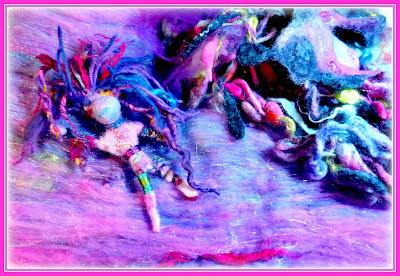 Felting is an amazing process, and people seem to recognize that when they see the bag. Can't wait to see what you work up for her. Great texture and very pretty! Very lovely little goddess ... she looks like a lot of fun! Thank you all so very much for all the kind comments! 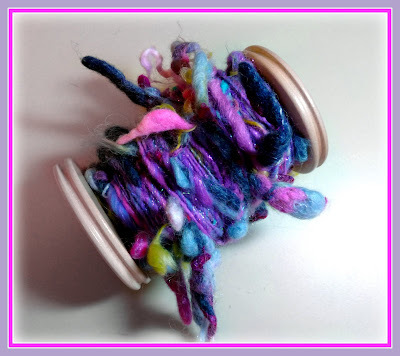 Heather, I see you save and treasure your scraps too, yes I would love to try spinning them into my art yarn!!! Oh so pretty and fun! Loving the texture and colours, good stuff!